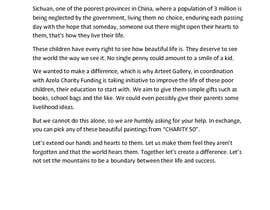 Arteet Gallery (Singapore) is holding a charity crowdfunding for Sichuan children on Indiegogo. We are looking for an extraordinary script which could emotionally inspire visitors to donate. You will hereby write a script for a 1-2 minutes video for the event page. This script is extremely important to postceding video production. Our video expert will create an animation based on the script that you write for us. Below are some basic info of the event. 1. Sichuan, one of the poorest provines in China. Home to 3 million extremely poor peasants. 2. One of the most remote county, Yato village, local government ignores the needs of 177 children. 3. Children lack daily supplies but they cannot afford them. 4. 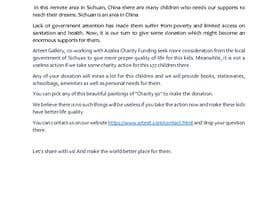 Arteet gallery co-works with Sichuan Azalea Charity Foundation. 5. 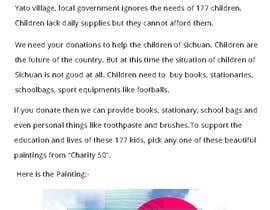 Arteet will buy books, stationaries, schoolbags, sport equipments, footballs for the children. 6. Donate to us, help the children, then you can pick and receive a painting from Arteet Charity 50 (50 paintings that we selected for the event). 7. Share, donate, help us. To support the education and lives of these 177 kids, pick any one of these beautiful paintings from “Charity 50”. Kindly contact us on [login to view URL] shall you have any questions. Please feedback #11 and 12. Thanks.